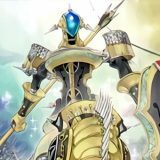 Continuing from our previous post, this article will cover all official playmats that were distributed in the OCG Asia regions in 2014. 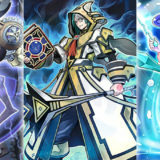 The playmats are listed in chronological order by date of distribution. As noted from the previous post, my personal subjective opinions were that the earlier distributed playmats were of relatively poor quality. 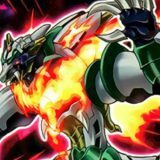 The material was thin, the printing was dull and only a limited few had graphical design of actual Yu-Gi-Oh! cards. However, 2014 saw a drastic improvement in the overall quality of playmats that were being produced. One major improvement was that there are lesser of the previously favored half size playmats, and more full size playmats being made. This is rather important in my personal opinion as the full size playmat supports the usage of the Pendulum Zones. 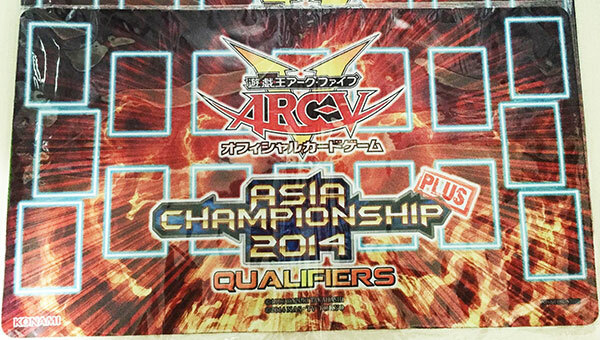 This playmat was given to the Top 3 players in each region’s Asia Championship Qualifier 2014. 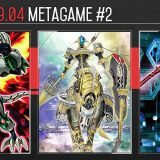 This full size playmat is the first in OCG Asia to feature the new Pendulum Zones. The printing is sharp and the colors are vibrant. 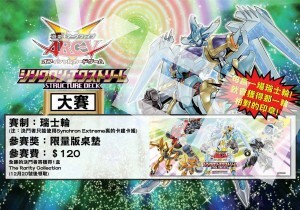 With 9 for Taiwan, 6 for Hong Kong, and 3 each for the other 3 regions, there are only 24 copies of this playmat in circulation. 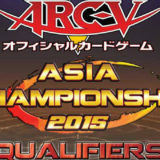 This playmat was given to the Top 3 players of the Asia Championship 2014. 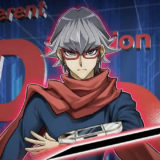 Featuring Number C39: Utopia Ray V, Number C39: Utopia Ray, Number 39: Utopia Beyond, Number 39: Utopia and Number C39: Utopia Ray Victory, this full size playmat is of good quality printing and coloring. It would be perfect if not for the obstructive Zones on it. 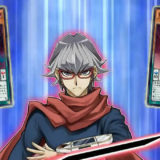 There are only 3 copies of this playmat in the world. 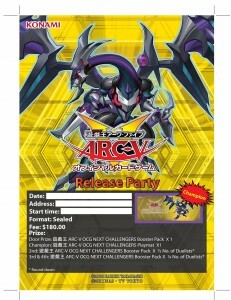 This playmat was given to the winner of the Next Challengers Release Party tournament. 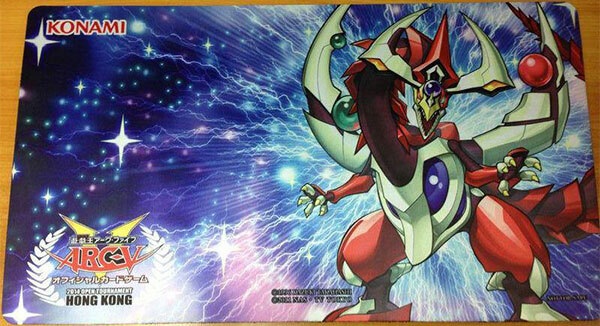 Featuring Dark Rebellion Xyz Dragon, this half size playmat is of decent printing and coloring. The design is a simple copy of “Next Challengers”. With 4 playmats for each region, there are only about 20 copies of this playmat in circulation. This playmat was given out for purchasing the “Machiners Command” Structure Deck (Traditional Chinese) during the promotion period. Featuring Machina Fortress, Machina Peacekeeper and Machina Gearframe, this half size playmat is of decent printing and coloring, but the design is a little plain. 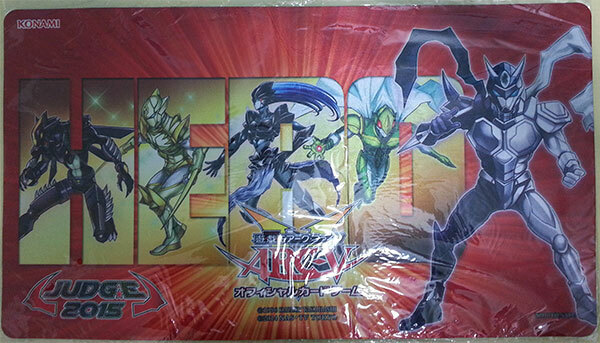 This playmat was given for participating in the Yu-Gi-Oh! Open Tournament Hong Kong 2014. 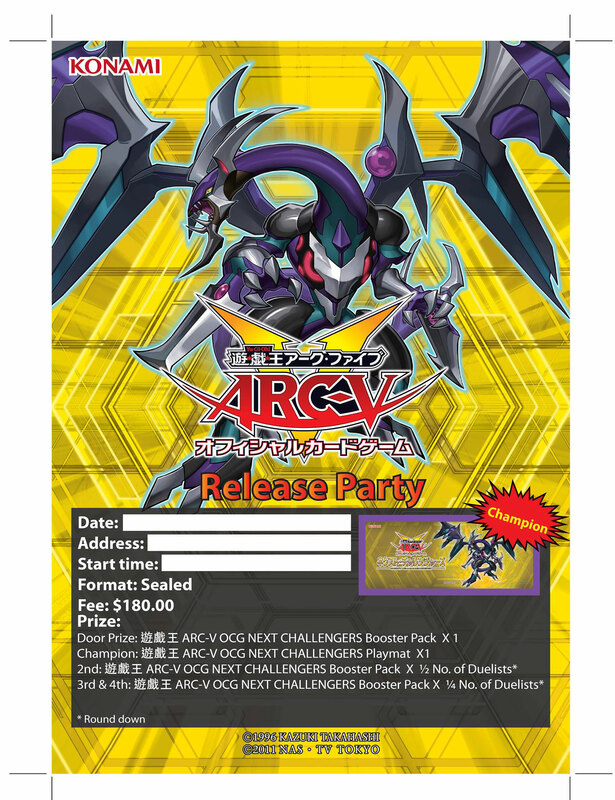 Featuring Odd-Eyes Pendulum Dragon, this full size playmat is of crisp printing and vivid coloring. The surface is of a glossy finish, which results in the coloring being a little darkened. There are less than a few hundred copies of this playmat in circulation. 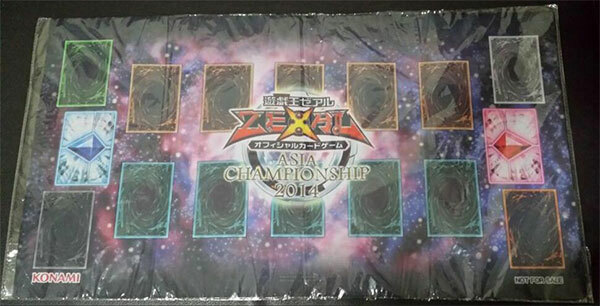 This playmat was given to the Top 4 teams of each region’s Asia Championship Plus Qualifier 2014. This full size playmat is of crisp printing and vivid coloring. The surface is of a glossy finish, but the bright burning red brightens up the contrast. With 24 each for Hong Kong and Taiwan, and 12 each for the other 3 regions, there are 84 copies of this playmat in circulation. 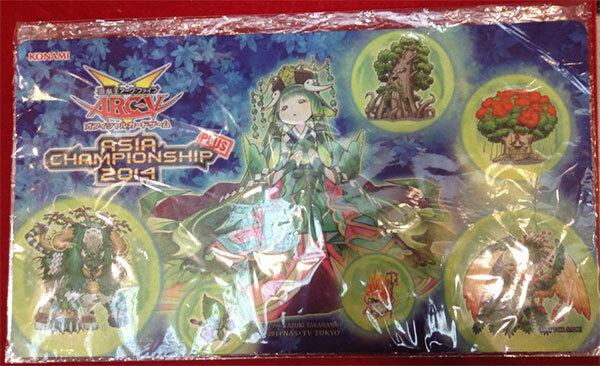 This playmat was given for participating in the tournament pods that were held at Anime Festival Asia Singapore 2014. Featuring Fluffal Leo, Fluffal Dog, Fluffal Cat, Fluffal Bear, Fluffal Rabbit, Fluffal Owl, Frightfur Wolf, Edge Imp Sabres and Frightfur Bear, this full size playmat is of crisp printing and vivid coloring. The surface is of a glossy finish, which results in the coloring being a little darkened, especially around the center of the playmat. 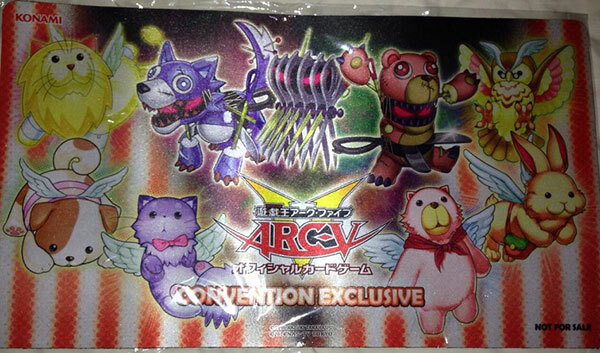 With 6 pods of 8 players for each of the 3 days, there are 144 copies of this playmat in circulation originally. 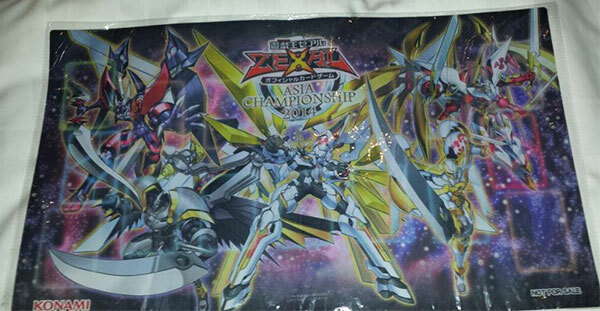 This playmat was given to the Top 4 teams of the Asia Championship Plus 2014. 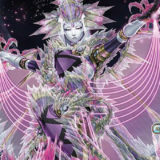 Featuring Alsei, the Sylvan High Protector, Sylvan Marshalleaf, Sylvan Komushroomo, Orea, the Sylvan High Arbiter, Sylvan Hermitree, Sylvan Sagequoia and Sylvan Princessprout, this full size playmat is of crisp printing and vivid coloring. The surface is of a glossy finish, but the contrasting green and blue brightens up the playmat. There are only 12 copies of this playmat in circulation. 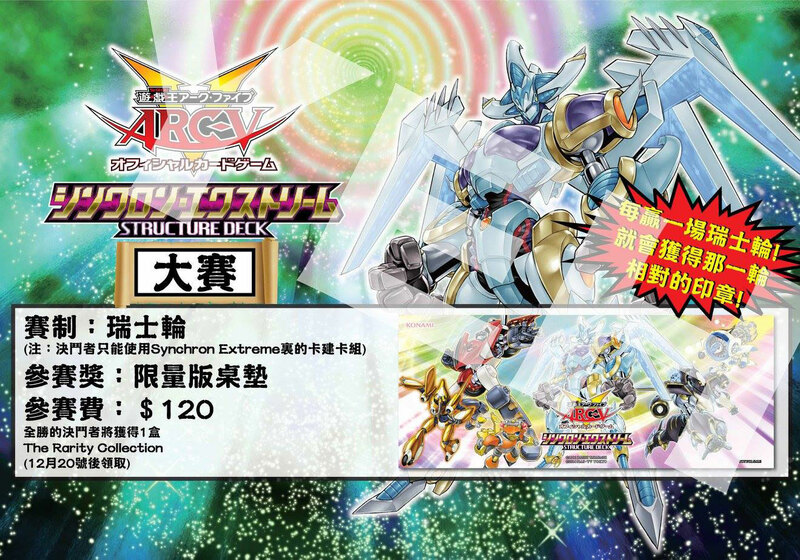 This playmat was given for participating in the “Synchron Extreme” Structure Deck Tournament that was held alongside the Asia Championship Plus 2014. 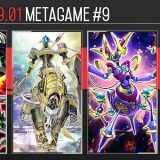 Featuring Rush Warrior, Accel Synchron, Synchron Carrier, Stardust Warrior, Jet Warrior and Jet Synchron, this half size playmat is of crisp printing and vivid coloring. The surface is of a glossy finish, but the rainbow palette brightens up the playmat. 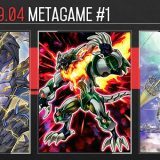 With 48 participants in the Synchron Extreme Structure Deck Tournament, there are only 48 copies of this playmat in circulation originally. 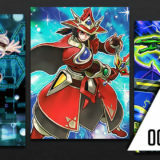 This playmat was given to judges as compensation for their time and effort in helping out in various OCG Asia Tournaments between 2014 to 2015. 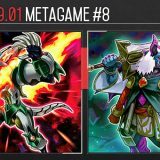 Featuring Masked HERO Dark Law, Masked HERO Koga, Elemental HERO Shadow Mist, Masked HERO Kamikaze and Contrast HERO Chaos, this full size playmat is of crisp printing and vivid coloring. The surface is of a glossy finish, which results in the coloring being a little darkened. My personal opinion is that the background is too disappointingly plain. 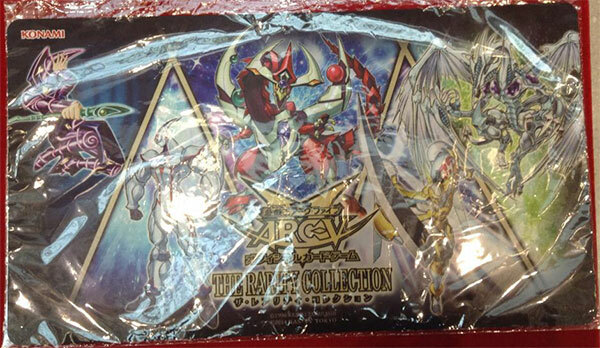 This playmat was given out for purchasing the “The Rarity Collection” Booster Pack during the promotion period. 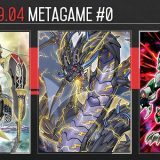 Featuring Dark Magician, Elemental HERO Neos, Odd-Eyes Pendulum Dragon, Number 39: Utopia and Stardust Dragon, this full size playmat is of crisp printing and vivid coloring. 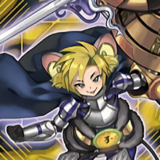 My personal opinion is that this is the best designed playmat from the OCG Asia region so far. The 5 signature monsters together with their original cards’ background and the simplistic golden borders creates a design that is timeless and classic.